Memories of Nehru come easily to Smith. The relative anonymity of life in west Delhi’s Mayapuri Industrial Area or the 13 years that have passed since he retired from The Statesman have done little to weaken them. They bring a smile to his face as we sit chatting on a small bench in a neighbourhood park. “My first memories of him," he says, “come through my father, Thomas Smith, who interviewed him in 1937 at his relative Dr Katju’s house in Agra." Once a soldier in the auxiliary army, Thomas Smith had joined The Statesman in 1930 as a correspondent in Agra. Over the course of his 25-year career with the paper, he’d interviewed Nehru a number of times. In 1954, he moved out of Agra, leaving behind a set of signed telegraph forms, and instructions to his son to file stories on his behalf. R.V. Smith thus inherited not only the memories and transcripts of some of the interviews but also a job that would bring him into contact with the prime minister frequently over the next decade. In those years, Nehru used to visit Agra frequently. The city was home to a large community of Kashmiris who’d settled there in the late 19th century. They’d bequeathed to the city the Kashmir mohalla and bazaar, the latter infamous for its dancing girls. Most of the Kashmiris had migrated subsequently, but a few, including Nehru’s cousins, the Kunzrus, had stayed back. Nehru used to visit them. On some of these visits Nehru displayed an almost childlike enthusiasm. In 1955, he took Soviet leaders Nikolai Bulganin and Nikita Khrushchev to the city to show them the Taj Mahal. He was very keen on taking them across the river Yamuna to I’timad-ud-Daulah’s tomb, but security considerations prevented that. “He loved Agra," says Smith, “often when he took foreign dignitaries there, he’d take on the role of tour guide." Between 1958 and 1960, Nehru gave election speeches at the Ramlila and Agra Club grounds. Smith was present on most of these occasions. Nehru’s style of speaking, he recollects, was unusual. He’d linger so long on every word that the audience was left guessing where the sentence was going. It was as if he was thinking aloud. “There’s one other funny thing about Nehru that nobody’s written about," Smith tells me conspiratorially. “He really did not like being questioned by young people. I always had the feeling that he was either trying to brush me off or run away." When he wasn’t being aloof, Nehru could be downright impetuous. In December 1959, he and American president Dwight Eisenhower visited an agricultural university funded in part by US aid, in Bichpuri, Uttar Pradesh. When their helicopter landed, a large crowd that had gathered surged forward. The security personnel tried to push them back, at which point the famous Nehru temper flared up, and the people were allowed to stay. Nehru then took Eisenhower’s hand and proceeded to show him around. But at some point the crowd grew restless and started moving forward again. “It was then," chuckles Smith, “that Nehru put the baton he carried under his arm to good use." 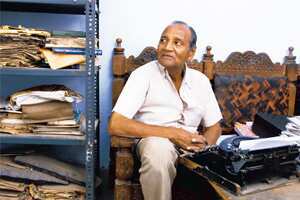 In late 1961, Smith moved to Delhi to become a reporter with the Press Trust of India. His first assignment was to stand at the Ramlila pandal gate at Red Fort. He remembers seeing Nehru being driven in, sitting with grandsons Rajiv and Sanjay Gandhi in the back seat and pointing out various things to them. A year later, Smith bumped into Nehru at a reception at the Vatican Legate in Chanakyapuri at which J.K. Galbraith, then US ambassador, and vice-president Zakir Hussain were present. During the course of the evening, reminisces Smith, the papal nuncio had turned to a senior home ministry official and enquired whether Delhi, like Agra, had Christian links. Seeing the official fumble for a reply, Nehru pitched in, informing the nuncio that Delhi had Armenian churches that dated back to the times of Jehangir and Shah Jahan. One of these, he told him, had been destroyed by Nadir Shah in 1759. 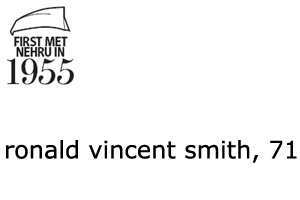 “He was a very keen student of history," says Smith. Even though he’d been in Delhi for nearly two years, Smith disliked the city intensely. Ever so often he’d flee to Agra. One of those trips coincided with Nehru’s visit to inaugurate the new Yamuna Bridge in Agra. There was a reception in the prime minister’s honour. Smith wasn’t keen to go, but his father dragged him to it. It was there that he noticed that Nehru’s face was red and bloated. “He was a very sick man. That evening I knew that he wasn’t going to live very long," he says sadly. On a hot May day, a few months later, he was passing by the Indian Express building when he saw “Nehru taken ill" on the spot-news board. He rushed to The Statesman office, where colleagues told him that the president, Radhakrishnan, had already left for Nehru’s residence. A few minutes later there was a snap on the teleprinter. Nehru was dead. The day after, Smith stood watching VIPs filing in for the funeral—Zulfikar Ali Bhutto was one of them. “I noticed," says Smith, “that Morarji Desai came smiling and waving to the people. He probably thought he’d become the next prime minister." At night, he and a couple of friends went to Shanti Van (where Nehru was cremated). “It surprised me how quiet it was there. A complete contrast to the life Nehru had lived, always surrounded by people," he tells me. He went back home that night and wrote a piece about it in The Statesman. Nehru’s greatest legacies, according to Smith, are the Five-year Plans and his idea of India as a socialist republic. “He made India respectable in the eyes of the world. Till him, we were just another British colony." Nehru was in Agra to address a meeting and Thomas Smith knew that after the meeting Nehru would have dinner at his relative Dr Katju’s house. Luckily for Smith, Dr Katju was an acquaintance, and that is where this brief interview took place. Nehru was clearly in a hurry. Thomas Smith (above) interviewed Nehru many times. How soon do you think India will gain independence? Depends on the whims of the British. But it is sure to come sooner or later. Do you see a clash between the Nazis of Hitler and Great Britain? Who can tell? I’m not an astrologer. How does the Congress hope to tackle the demands of the Muslim League? There is always room for discussion. Will Mr Jinnah adopt a more flexible attitude? I have seen your pictures with George Bernard Shaw, Einstein, C.V. Raman and Rabindranath Tagore. What do you think of them? They are all great men. 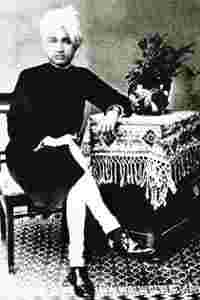 A lot has been made out of the reported differences between you and Subhas Chandra Bose. Any comments? Differences, if any, have been exaggerated by the newspapers. Is there a power tussle between you and Sardar Patel? Who told you? We are on the best of terms. Does Mahatma Gandhi regard you as his heir? What is the India of your dreams? A land of peace, harmony and plenty. No more questions, I think I’ve said enough and Dr Katju is waiting for dinner. Nehru was visiting Agra to inaugurate the new Yamuna Bridge. A reception was organized in his honour in the evening. Thomas Smith had taken his son along to the reception. The elder Smith tailed Nehru and finally managed to corner him. It was at this interview that R.V. Smith noted how ill and tired Nehru was looking. Sir, you have laid the foundation of a new Jamuna bridge at Agra. What are your comments? Agra has always been dear to me as much for the Taj Mahal as for I’timad-ud-Daulah’s tomb, with which I have a special affinity. A new bridge over the Jamuna will be a welcome addition to the existing two. Are our ties with the USA strained? Strains and pulls make good news stories. Let us remain friends. Our relations with Pakistan over Kashmir seem to be deteriorating. Is it true? Kashmir is a part and parcel of India, but our relations are not as bad as made out to be. Some think that Mr Krishna Menon’s attitude at times harms the government. What do you say? Nobody is harming the government, least of all Mr Menon. Any comment on the India-China conflict? None. I’ve had enough of it. My health is as fine as it should be at my age. Who comes after me is not my problem. Jai Hind!